TV show dates: March 26, 2018 — present. Performers include: Jared Harris, Tobias Menzies, Ciarán Hinds, Paul Ready, Adam Nagaitis, Nive Nielsen, Ian Hart, Trystan Gravelle, Chris Corrigan, Christos Lawton, Matthew McNulty, Sebastian Armesto, Edward Ashley, Jack Colgrave Hirst, Mike Collins, Kevin Guthrie, Aaron Jeffcoate, and David Walmsley. Based on the Dan Simmons novel of the same name, and inspired by a true story, The Terror TV show is al fantasy drama anthology. 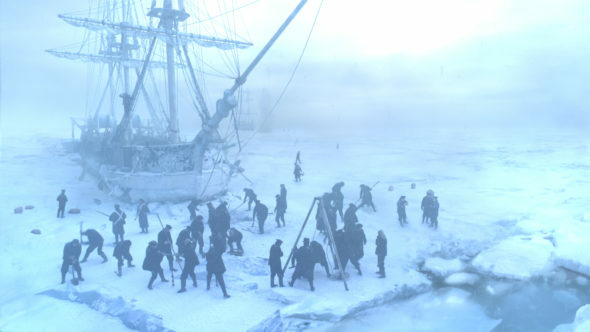 The first season centers on the Royal Navy’s perilous voyage into unchartered territory, as the crew attempts to discover the Northwest Passage. Despite heightened fears, fading hopes, and scarce supplies, they forge on toward the ends of the earth. As skipper of the HMS Terror and the expedition’s second in command, Captain Francis Crozier (Harris) is a first-class sailor, but because he is Irish, he is unlikely to rise any higher in Her Majesty’s Royal Navy. Setting aside any feelings he might have about his second-class treatment, Crozier rises to the occasion when calamity arises. Captain James Fitzjames (Menzies) is second in command of the Erebus and third command of the expedition. Despite his inexperience in the polar regions, with his star on the rise, Fitzjames has earned the trust of his captain, Sir John Franklin (Hinds), who commands the expedition. Fitzjames and Crozier are ill-at-ease with one another, and the tension between them grows as their circumstances become more dire. An experienced leader with a spotty record, Captain Franklin is more well-liked than respected. He lost crew members on an earlier polar expedition. Now, he is trying to find a way to go out on a wave of glory, by discovering the Northwest Passage. “Pride goeth before a fall,” ought to be his watch-words. Of the four physicians on the voyage, Dr. Harry Goodsir (Ready) is the most junior. Upright, kind, and open-minded, he enlisted with the Discovery Service to explore the wonders of the Artic. He’s the first one aboard to realize something supernatural is at work. The daughter of a Netsilik shaman, “Lady Silence” (Nielsen) is concerned that the two European ships and their crews will destabilize her homeland’s natural balance. Soon though, she realizes she has to find a way to protect her people, as well as those on the expedition who have earned her friendship. It may be up to her to stop the supernatural catastrophe which threatens them all. Through the course of this ordeal, The Terror explores everything that can go wrong, when desperate men struggle with their environment and one another. What do you think? Do you like The Terror TV series? Should this AMC TV show be cancelled or renewed for another season? I like this show and I’m waiting for a 2nd season! Would definitely watch a second season. We have to know what happened to the only survivor at the end of Season 1. What about all the expeditions that sailed to find the Franklin party including the HMS Resolute? I agree with Bob – the last episode concluded the story very well. Enough for me. Will not watch if there is a second season. if its from abook there should be a few more season’s. That show had my wife and I at the edge of our seats from EPP. 2 till the end . you guy’s did a greatjob 254 is the best!!!!! I thought it was an excellent show and the season finale tied a lot of loose ends together. I intend to watch it again so I can pick up on things I missed the first time around. Looking forward to a Season 2 with a new story and cast. Bring it on. Boring, lacks depth. One big mean monsters chasing sailors. Blah from Ridley Scott who can do much better than this. More boring than watching my hair grow! Thank you. I thought I was on another planet when people were saying it was good. It did have potential, but fell so far down in every respect. I was shocked that R. Scott had anything to do with it. They must have given him $10 as a budget. Totally a waste of time and money. Please no more. Awesome show, Jared Harris and Tobias Menzies are two of the best actors there are. I don’t know how more people aren’t watching this show. It’s so haunting, one of my favorite shows of the past few years so far. This show is REALLY GOOD! Exactly what I was thinking, not like anything else and just a really great show! I love the added fact that it was based on a real life tragedy! !